Keytronics (Pilot) Model EO5305RS keyboard typing masks are the perfect tool to allow your keyboarding students to learn touch typing skills without looking at the keys. The masks slip on and off quickly and will not interfere with a student's work. 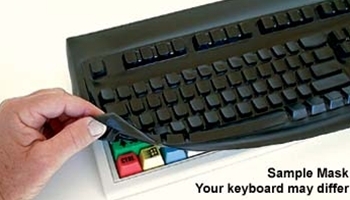 Keyboard typing masks wrap around your keyboard allowing the keyboarding student to type without looking at the keys. The masks are custom made to each keyboard model to ensure a tight fit that does not interfere with touch-typing techniques. The masks are made of opaque black material that easily slips on and off while providing years of classroom use. The opaque material keeps students from seeing the keyboard keys while they are mastering touch typing skills. The masks are precision molded from flexible, durable polyurethane material that will provide years of use. The mask will not interfere with learning touch typing. The covers are easy to install and remove. Masks can be used over and over for years. The masks also protect the keyboard from spills and contaminants while providing a blind keyboard for learning the keyboard. We have typing masks for hundreds of different keyboards and laptops and we are adding more everyday. If you do not see your keyboard model or laptop in our list, contact our Sales Department using our convenient contact form (or call 800-223-0123) to see if we have a mask that fits your keyboard.